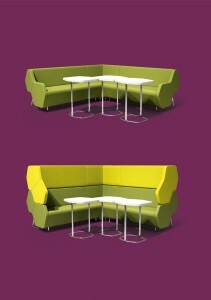 Our latest Modular Lounge system is both comprehensive and adaptable. Choose from traditional low level lounge seating and our more private high-back configurations. Available in almost any fabric, Exa may be adapted to your space as required; specify section upholstery in your preferred range and colour. Sections (seat, lower back, upper back & armrests) may be finished in different materials.